Bioluminescence is the production and emission of light by a living organism. 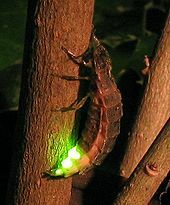 It is a form of chemiluminescence. 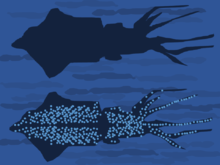 Bioluminescence occurs widely in marine vertebrates and invertebrates, as well as in some fungi, microorganisms including some bioluminescent bacteria and terrestrial invertebrates such as fireflies. 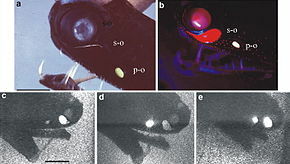 In some animals, a firefly squid has bioluminescence, the light is bacteriogenic, produced by symbiotic organisms such as Vibrio bacteria; in others, it is autogenic, produced by the animals themselves.